Disclosure: This post is written by me on behalf of Sunstar GUM. All opinions expressed are 100% mine. Growing up my mom taught me very early on about the importance of oral health. We went to the dentist on a regular basis, brushed and flossed regularly. My sister and I even had a singing toothbrush to time us, well back in the 80’s it was more like the stand sang not the toothbrush but it was pretty cool back then. I owe her my smile and the fact that I had my very first cavity into my 30’s was a pretty good lesson she taught me. Its something I pass down to my children and take very seriously. These days about half of Americans over 30 have gum disease? Gum disease is inflammation in the gums, an accumulation of dental plaque, which can cause tooth loss, receding gums, tooth sensitivity and pain. The major problem is gum disease is linked to diabetes and heart disease causing a bigger issue with your health. Sunstar GUM the popular brand of oral care including my kids favorite toothbrushes, is launching a new campaign called #YourGumsMatter. 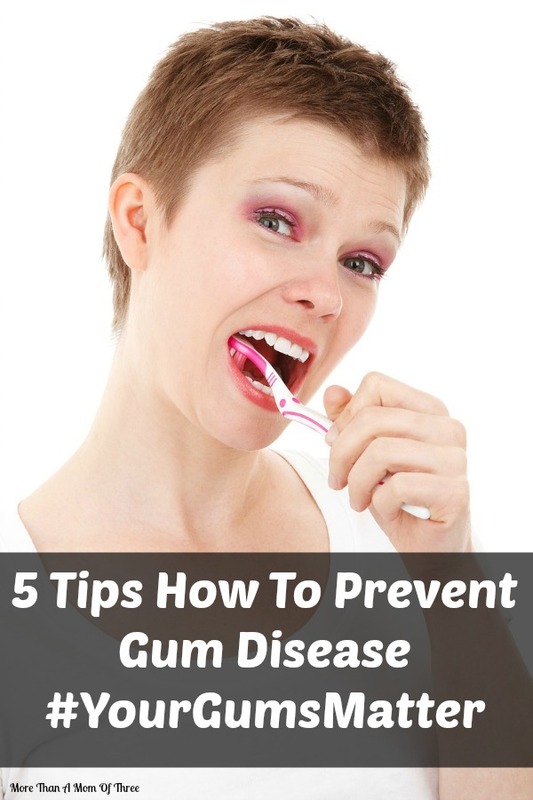 They want to raise awareness about gum disease and how it can be prevented very easily with just a few steps. Brush your teeth twice a day – Gently brush the gum line too! Plaque can build up in between the teeth and gums causing infections that could possibly affect the bones that hold your teeth in place. Floss at least once a day – If not twice! You never know what kind of food particles could be lying around in between your teeth. Eat a balanced diet – Things like soda and sugary snacks can damage your teeth so trying to limit your daily intake will help. Visit you dentist regularly – Try to get a cleaning once a year. By visiting your dentist hopefully you can catch major oral health things early. Don’t smoke – Smoking not only ruins your pretty pearly white teeth but can have a major effect on your overall oral health. Check out more information about the #YourGumsMatter campaign and while you are there you can sign up for a money saving coupon as well! Healthier teeth leads to a healthier body so by instilling good oral health routines at an early age can help your kids later in life. These are great tips! I do well on most of them but that darn flossing… I can blame it on my parents that they never had my brother nor I do it when we were growing up so it’s extra hard to make it a habit now, right? That one is tough for me too – I just forget sometimes when I am tired before bed. I have problems with my teeth and gums, but working on getting it all fixed up. Hopefully I can get it all taken care of! Thanks for the tips! I’ve always tried to take excellent care of my teeth/oral hygiene. Thankfully my children have followed suit. These are great tips! I recently had my first trip to the periodontist and it was NOT fun! But, I have become a fanatic about taking care of my gums (and a GUM brush is part of that routine). Chrysa recently posted…Summer Savings on Blue Bunny Ice Cream! Yes this is so true!! great information. I never really think about gum disease. I really do need to pay more attention. Visiting your dentist at least once a year definitely can be a huge help in preventing gum disease. Even if you stay on top of brushing and flossing your teeth every day, there’s still a chance that problems can come up. The dentist can catch any developing issues before they get too bad. McKayla Strauss recently posted…Hello world! To keep your mouth healthy it’s important to visit a dentist regularly. As gross as this sounds, I always forget about flossing when it comes to dental hygiene. Ever since I had braces, I just stopped thinking about doing this. However, I agree with you that it’s important to do this to make sure that you get the food out in-between your teeth. Doing this will always improve your dental hygiene. Thanks for the reminder! I know a lot of the time, people forget that their diet can have such a big impact. But too much fat, sugar, or acidic materials can really hurt your oral health. And you can’t just cancel it out by brushing well, you really have to keep that stuff in moderation and take care of your mouth. Liz Armeson recently posted…Hello world! I think I’m starting to get gum disease on my bottom jaw. The gums between my front bottom teeth are really swollen and red, and do not lay flat against my gums. I’d say there’s probably 1.5 millimeters of excess tissue that flaps away between my teeth. There’s a big pocket of air between those two teeth, over where the gum lays. Should I have that removed? Or might that damage my teeth to have that exposed? I do a good job taking care of my teeth. I brush twice a day and try to floss every morning as well. I still get some bleeding when I brush though. Does anyone have an explanation for this? I love the campaign! Hopefully it encourages more people to take care of their teeth. It can be easy to forget good dental care, but remembering these tips you posted can make it a breeze. Thanks for sharing. The fact that you got your very first cavity at age thirty really speaks to your mom’s guidance, just as you shared. Your 5 tips are quality ones.